Barnett’s Towing has one of the most diverse fleets in Arizona and have trucks registered to tow and transport out of state. We can handle any type of towing, transporting or recovery situation; from a light duty rollback, to Heavy Duty Wrecker and the most unusual recoveries utilizing Rotators and air-bags. Barnett’s fleet is bar none the largest in Arizona. We have the equipment to respond to all calls where most companies can only watch. The Barnett’s family knows there is no substitute for the properly maintained equipment to get the job done right. We rely on this equipment day-in and day-out and we know the equipment is up to date with State and Federal regulations. Barnett’s Heavy Duty and Super Heavy Duty Tow Trucks were designed to handle the heaviest of trucks on the road today. Our sliding axle and 3axle low boy trailers make the perfect fit for transporting generators, buses, fire trucks, and construction equipment. We have several of the latest light-duty trucks being used today. This gives us the ability to transport a standard to the most exotic car for our customers. 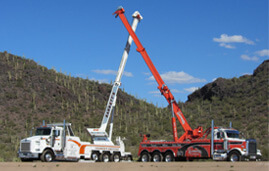 Barnett’s knows, by having new equipment and state-of-the-art training and techniques allowing for damage free towing, we have become one of the leaders in the towing and recovery industry.